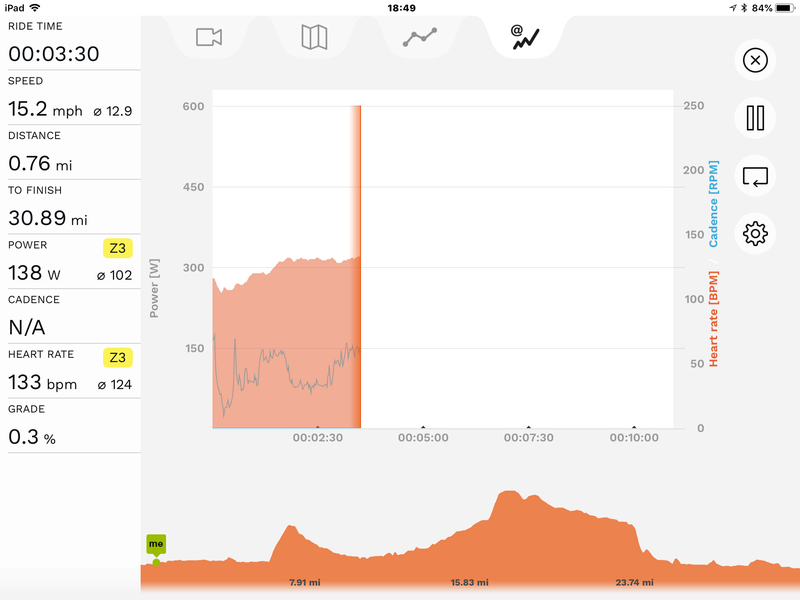 I can manually control the trainer using the Wahoo ELEMNT bike computer. This lets me set the trainer to hold a particular effort level so I can just steadily pedal, or to load interval workouts that I’ve created or been assigned in TrainingPeaks. I can drive the trainer using the Zwift app. This allows me to ride through a video-game-looking world with other virtual riders; there are courses that cover London and Richmond, along with a mythical island kingdom known as Watopia. I can ride Sufferfest videos, which I love doing, and the app can control the resistance of the trainer according to whatever workout I’m supposed to be doing. However, there’s one programming source I hadn’t tried yet– I wanted to experiment with riding a real-world route. Specifically, I wanted to ride the IRONMAN 70.3 Chattanooga bike course on the trainer, so that I could see the course and get used to the hills, but the weather was bad on the course-preview-ride day and the logistics didn’t work out for me to get there another time. I figured I’d try doing it in software. First I downloaded Bkool, because a friend of mine had recommended it. After signing up for the free trial, I found that the app would crash immediately after sign-in 100% of the time on my iPad. Thank goodness for free trials. Then I went to poke around the DC Rainmaker site and found this typically thorough guide to trainer apps. After reading it, I downloaded 2 more apps: FulGaz and Rouvy. Like Bkool, they both have free trials. I tried FulGaz first and was really impressed with how pretty it was– but it didn’t have the Chattanooga course, so that was that. Next I tried Rouvy. Signup went flawlessly and I found the Chattanooga course, loaded it, and started riding. What I didn’t notice is that it was the Chattanooga 70.3 World Championship course. I couldn’t figure out why it was so damn hilly and tough. Eventually I did figure it out. But that’s another story. Below are a few screen shots from a ride I did the other day along the route for stage 1 of the 2017 Tour de France. Rouvy shows three or four views, depending on how the course is set up. 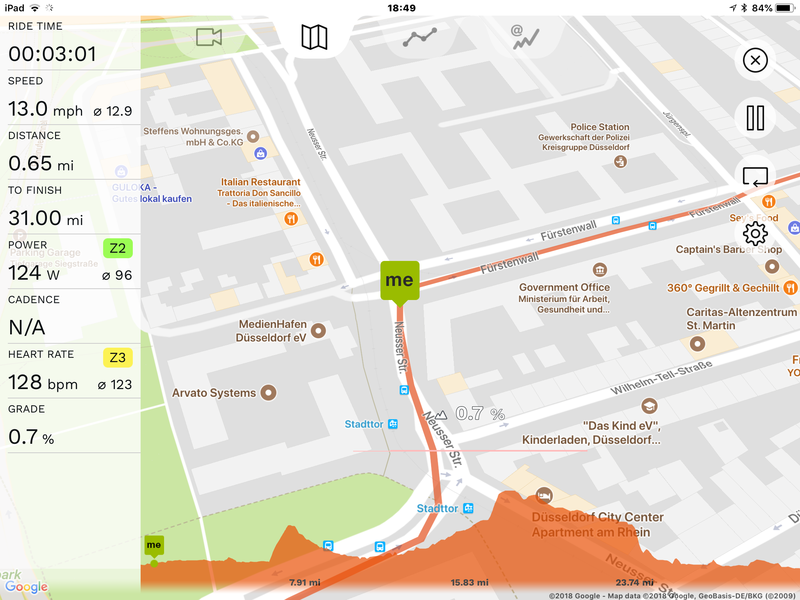 The first view is the default, showing you a Google Maps-based view of the area, with a data pane on the left showing pace, power, etc. You can see that I’m at the very beginning of the stage, which started in Dusseldorf. You’ll see this view any time there’s no video associated with the course. 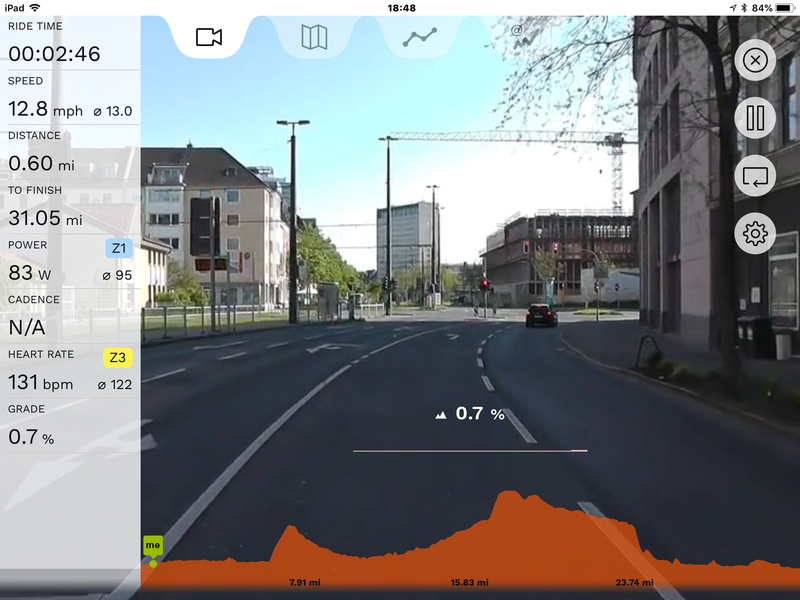 The course view shows you what you’d see if you were actually riding on the course. You can see power, pace, and so on in the left pane, and there’s a helpful horizontal scale that shows you the current incline (0.7% in this case) along with the upcoming incline. The video is synchronized to your pace, so the faster you pedal, the faster you appear to be riding. Different routes have different video quality, depending on what kind of camera the rider used, whether it was stabilized, and so on. The next view is all data. I don’t really want to look at this view when riding, but it’s there if you like it. 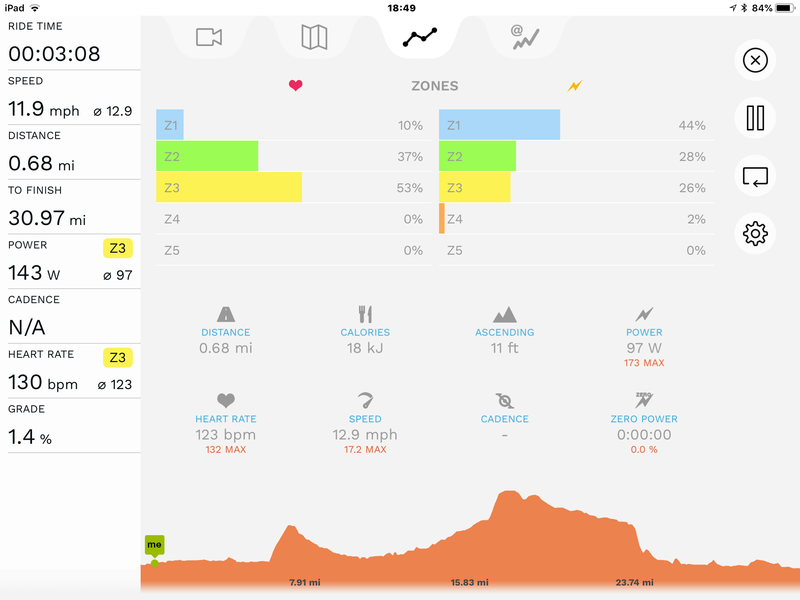 The fourth view, shown above, shows you a real-time strip-chart-style view of your 3 key metrics: heart rate, pedal cadence, and power output. You also get the profile view along the bottom to show you the terrain you’re riding over. Everything I did with Rouvy worked flawlessly: when I finished my rides, they were automatically uploaded to Strava and TrainingPeaks, the auto-pause and auto-resume features worked well mid-ride, and I didn’t have any problems with video dropouts or freezes, application crashes, or other ill behavior. I need a few more rides with it to make sure, but I love the idea of being able to ride a real course, with video when I want to see it. Typically if I’m doing an interval workout I’ll use a Sufferfest video and stream it to the projector; if I’m doing an endurance ride I’ll put on Zwift (so I get some variety in the route and terrain) and leave it on the iPad while I watch Netflix or something on the projector. The ability to ride a real route, with high quality video on the projector, might be enough to get me to change that habit.